One of the most relaxing and convenient routes direct to Brittany is the Portsmouth to St Malo Ferry. This service is operated by Brittany Ferries. The service is an overnight crossing from Portsmouth leaving around 20h30* and arrives around 08h30* the following morning. The usual ferry to operate this route is the mv Bretagne (pictured at the St Malo Ferry port) and has an excellent choice of restaurants and cabins or reclining seats. The name of this ferry, “Bretagne” is French for Brittany. The mvBretagne was launched in February 1989 and has a gross tonnage of 24,534 tons. It has a capacity of 580 cars, 39 freight vehicles and has 376 cabins. During 2009 the Bretagne underwent a 6 million euro refit in Gdansk, Poland. 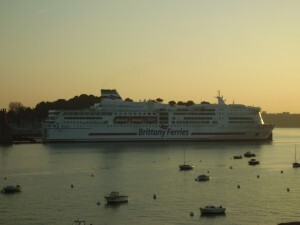 There is an independent website run by enthusiasts which can be found at www.bfenthusiasts.com, which offers information, chat and forums on Brittany Ferries fleet of ferries to France. With excellent onboard facilities the crossing to St Malo takes you direct to the gateway into Brittany. On the approach to the ferry port of St Malo enjoy the panoramic view of the walled city of St Malo – the intra muros as the sun makes it was over the tops of the buildings of this historic city. The intra muros is well worth a visit. Within the walls of this city you will find many excellent restaurants most offering a selection of seafoods. Enjoy a walk around the ramparts with spectacular views of the islands and nearby Dinard. During the summer months the Place Chateaubriand comes alive with street artists and painters and music. With an excellent road network , arriving at St Malo Ferry port is ideal to start exploring Brittany. Returning back to the UK, the ferry leaves around 10h30* in the morning arriving back in Portsmouth early evening around 18h30. Condor Ferries also operate a service from the UK to France and details of their service can be found at www.condorferries.com. St Malo is a great starting point for vacations in Brittany or as a base to search for a Brittany property. Bon Voyage on the Portsmouth to St Malo ferry!